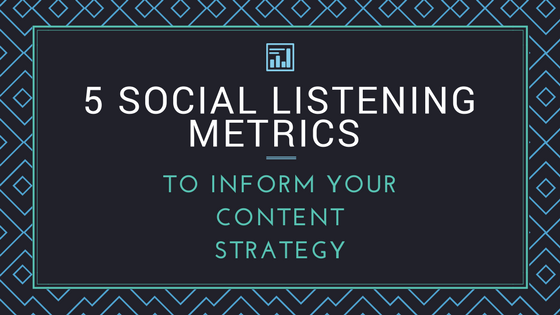 Give your content strategy that extra boost with these social listening metrics. You know you need a solid strategy and foundation in place to move forward, but how do you do that? What are some ways you can gain inspiration and ensure the content you produce will be the most relevant and engaging for your target audience? One way to do this is to use social listening data. Social listening can act as a focus group giving you unsolicited conversations from sources all over the web. This can range from social media to blogs, forums, news sites and more. The natural language processing capabilities of some platforms can also provide highly accurate, automated text analysis. This allows you to quickly and automatically grab insights to start informing your content strategy. With so many metrics and ways to slice and dice the data, how do you know which metrics really matter when beginning your research for content strategy? To get you started, we’ve outlined 5 social listening metrics to help get your strategy moving. Post volume may seem like an obvious metric when you are trying to gauge the general interest of a specific topic or audience. It’s an easy number to wrap your head around. The biggest number wins. But, post volume can tell you more than just what topics are discussed most. Are they already engaging or discussing this topic? 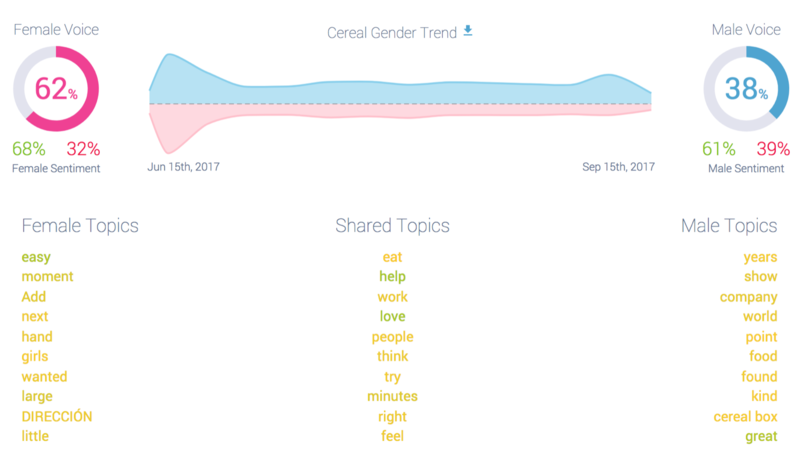 What topics are trending over time? Historical post volume can tell you if a topic is growing in interest year-over-year or if audience interest is declining. This allows you to be proactive rather than reactive. It will help you determine if it’s going to be relevant and worth your time. Share of voice can give you insight into which topics are discussed most frequently in relation to a category, industry, brand, or even audience. This can help you determine what will be the most engaging content to write about or even where you have an opportunity to increase your own authority of a topic. This can help you speak the same language as your target audience as well as use the most relevant examples. Share of voice can also help you assess how well you match up against your key competitors. You can determine this on a number of different levels. Who has the largest share of conversation volume? Which brand is discussed most on social media, blogs or news sites? Which brand has more conversation around purchase intent or expectation? This can help you evaluate not only where each of your competitors falls, but more specifically how your audience associates emotions and themes with each brand. Sentiment is another obvious metric, but shouldn’t be overlooked. The importance of knowing how positive, negative or mixed your audience feels about a topic or brand is still extremely valuable. This can help you change the conversation or reinforce the way people think and feel about your brand. Sentiment analysis can also help you ensure you are creating the most engaging content for your audience. The more favorable a topic you are discussing is, the more likely you are to receive positive engagement. Demographics are an important component that make up your audience profiles. How can you begin to plan content for your audience if you don’t know who they are? Demographics can give you information like age, gender, education, household income, and more. You can even find out how men and women speak about shared and different topics. For example, when talking about breakfast cereal, how do women and men speak similarly and differently? By understanding these key factors about your audience, you can more effectively create the right content for the right people. Now that you understand your audience and the topics most relevant to your brand, you may also want to know what sources are the most influential. Social listening platforms can tell you the influencers related to specific topics you are researching. This can be a great way to find relevant sources in your research, cross promotion opportunities, develop strategic partnerships, and help inform your content distribution strategy. Influencers help you know where you audience turns when they want to know more about a topic. The people have spoken and you’ve listened. You now know how often your target audience discusses a topic, how they feel about specific topics, who discusses it the most, what your audience looks like and how they talk about subjects differently, and who the most influential sources are. With these 5 social listening metrics you’ve set yourself up for a data-driven content strategy. You can take these learns and confidently apply them to your strategy development, knowing you’re producing the most relevant and engaging content for the audience most important to you.